On the return time, we offer a 15 minute grace period, after which we charge $40 per hour for every hour late up to 2 hours. After 2 hours we charge a 1.5 days rental rate. All rates include mileage of 200km per day, plus propane for on-board appliances. 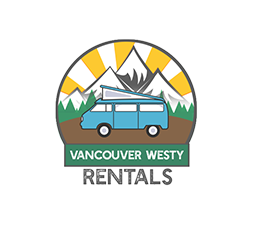 Taxes in BC are 7% Provincial Sales Tax and and 5% Goods and Services Tax and are charged on the rental fee, extra mileage and the rental of additional gear. There is no tax on the auto insurance. No Off-Road use or towing is allowed with our Eurovan’s. Meaning the Eurovan’s must stay on paved roads only, with the exception of some campgrounds that may have a graded gravel road. All Eurovan rentals come with 24 hour roadside assistance. In the event of a mechanical issue or accident, all travel costs incurred as a result of become the renter’s responsibility.